I purchased a few fuses to get familiar with their workings, and I was surprised to see that the 100mA fast-blowing fuses I bought happily conducted up to 215mA (6V power supply, 10\$\Omega\$ resistor), where the filament just started glowing. I could reproduce this with a second fuse. Am I gravely misunderstanding something here, or is this an issue with the fuses? They are Bel Fuse Inc. 5SF 100-R parts. Even fast fuses don't respond immediately after the rated current is reached. Most fuses require a significant over current to fire almost instantly. This is an obvious requirement since its all about heat, and minor heating (a raise ambient temperature) shouldn't affect the fuse too much (or at least not cause it to "blow"). 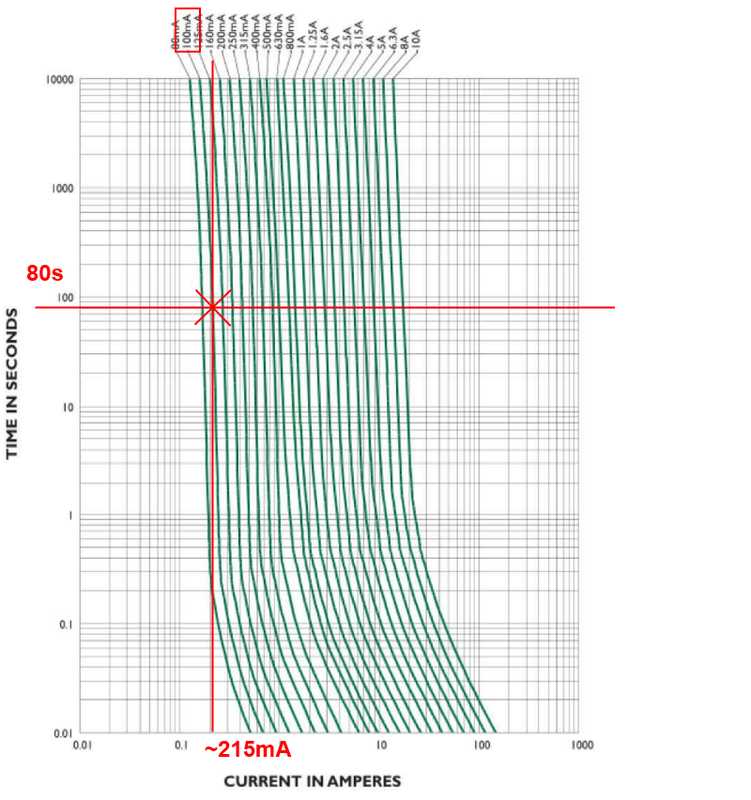 Judging from the data-sheet, your 100mA fuse should blow after about 80 seconds @215mA @25°C. Glass fuses, especially at very low ratings, aren't really meant to be that precise. You cannot, for example, just inline a 2N3904 with a 200 mA fuse and expect it to protect the transistor in all circumstances. You would, after all, expect it to NOT blow at 190 mA. In this example, you would probably want to over-specify the transistor and use a fuse at double the maximum expected load. If the user does something silly, like shorting the output, the fuse will do its job. There were two main types of rating used for fuses. The nominal rating which is the current the fuse will carry for 1000 hours without failing at a temp of 20 degrees centigrade. The service rating is the current the fuse will carry for 1000 hours without failing at a temperature of 100 degrees centigrade. The service rating is 80% of the nominal rating. E.g. a fuse with a nominal rating of 10 amps has a service rating of 8 amps. Confusion arose when the equipment in use before 1962 would quote either of the ratings. (EMER General O 001, 1962). Of course, there is a relatively unknown online reference known as Wikipedia which has some potentially helpful hints too. Not the answer you're looking for? Browse other questions tagged fuses or ask your own question. Why did my fuse blow after 3+ years of no problems? Do fuse blow on ampere or effect? Why does fuse blow up sometimes? Why can't I blow a fuse? Are there ways to determine whether or not a fuse will blow if placed into a circuit? Will the fuse blow for long time use? Slow-blow fuse equivalent for overvoltage?